We’ve all heard the saying, “everyone makes mistakes.” But when you’re the one who’s to blame, it’s can be harder to remember that you’re not alone. Over the past two years working in a lab at UConn, I’ve made many mistakes and been forced to face the consequences. In this post, I share with you some of my biggest ones in the hopes that we can all feel a little less alone the next time we mess up. Last spring, one of my jobs in the lab was to sputter coat flow sensors with gold and then wet-etch them. This process was very tricky and often three quarters of the sensors would break during wet etching. The senior design team in my lab was counting on the sensors for their project presentation coming up, and I was responsible for providing them. The day came to separate the sensors, and to my horror, every single flow sensor broke. I had to walk out of the lab room and tell my mentor and the entire senior design team that, thanks to me, there would be no flow sensors available for them to test on. Needless to say, no one was very pleased with me, least of all myself. What I learned from this: How to own up to my mistakes in front of people who I respected, which is never easy. Luckily, no one stayed irritated for very long, and I learned how to shoulder the blame when I made a mistake and move past it quickly. Over the summer, I was working on putting together a flow sensor compartment, which consists of several small 3D printed pieces screwed together. One of them wasn’t fitting correctly and I was getting more and more frustrated. Suddenly, an essential piece snapped right off. The project was set back a week because we had to wait for another piece to be ordered. Again, no one on my team was very thrilled about this! What I learned from this: I shouldn’t take my frustration out on tiny 3D printed plastic pieces. Also, before completing a task it’s important to take a step back and evaluate the level of care required. I was treating the piece as though we had hundreds of extras lying around. If I had stopped to consider the consequences of it breaking, I definitely would have treated it differently. Each week, the members of my lab group alternate giving presentations to our principal investigator and each other. My week came around, and I completely forgot about the presentation until 20 minutes before. I hastily scrambled something together but completely forgot to include any background information on my project for those in the lab who aren’t involved. It wasn’t long before my lab mentor interrupted and reprimanded me for this error. What I learned from this: Write everything down on my calendar to prevent forgetfulness. In addition, I was able to practice accepting criticism graciously. I believe this is an extremely important skill, and one that you can only master by making mistakes and being critiqued. I hope these three examples are a reminder that everyone does make mistakes, especially first-time researchers. The most important thing is to learn from them and make necessary changes in your protocol or behavior. 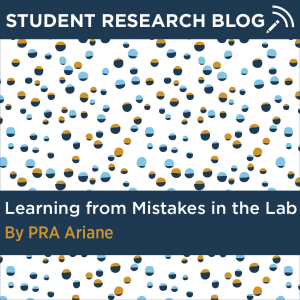 Don’t let a few errors dissuade you from pursuing research, and remember that in the long run, how you handle the mistake is much more important than the fact that you made one to begin with. Ariane Garrett is a junior double majoring in biomedical engineering and Spanish. Click here to learn more about Ariane. This entry was posted in Student Research Blog. 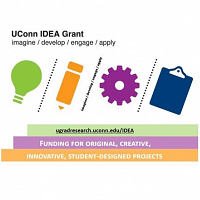 The Office of Undergraduate Research invites you to join us as we celebrate the accomplishments of our tenth and eleventh cohorts of UConn IDEA Grant recipients. Projects will be on display and the grant recipients will be available to discuss their work. This event is open to the University community.